A rare Yangtze River Dolphin, in an aquarium in Beijing, in 2002. The Yangtze River dolphin, one of the world's rarest mammals, is no more, a victim of China's breakneck economic growth and competition for food with one of the world's most common large mammals  human beings. "We can say that the animal is functionally extinct," says August Pfluger, head of the Zurich-based Baiji.org Foundation, which in December co-sponsored a six-week, 2,000-mile (3,500-km) survey of the Yangtze without finding a single remaining member of the critically endangered species. The dolphin, one of only four exclusively freshwater species in the world, may have the unhappy distinction of being the first aquatic mammal to go extinct in more than half a century  and the first large mammal driven into oblivion by environmental degradation. Nicknamed the "goddess of the Yangtze," and long considered auspicious by fishermen, the pale-colored, human-sized dolphins have always been rare: a 1997 survey recorded only 14 left in the river. (A captive dolphin died of old age in a Chinese zoo in 2002). But Pfluger says human pressure pushed the baiji past the tipping point. "The main reason is overfishing. The Chinese still use unsustainable fishing methods like dynamite. There's still a lot of illegal fishing, so the dolphins were competing with humans for food." According to Wang Ding, a researcher at the Wuhan Institute of Hydrobiology and a leading expert on the baiji, damming on the river and noise from heavy boat traffic may have disoriented the dolphins, which are mostly blind and search for food in the sandy shallows using sonar. The confused and starving animals may then have wandered into boat propellers. Heavy dredging in shipping channels could also have made it harder for the animals to locate each other and hunt for increasingly scarce fish. "Dredging is a very serious problem," Wang says. "It destroys spawning grounds of fish. There are also too many boats. 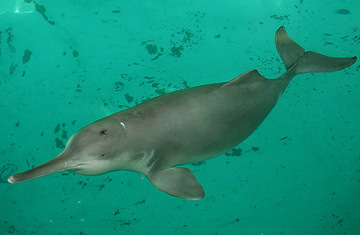 The baiji depend on their sonar ability to survive." As top-level predators, dolphins like the baiji are an "indicator species"  bellwethers of the general health of an ecosystem. Their disappearance bodes ill for the Yangtze, which supports more than 400 million people, roughly 6% of the world's total population. Wang says the Yangtze is relatively unpolluted. But untrammeled commerce and massive hydrological projects like the Three Gorges Dam have dramatically altered the river's landscape. With as many as 60 boats per km of river in some areas, the Yangtze already looks less like a river than a highway during rush hour. "Baiji are at the top of the food chain just like human beings," Wang says. "If the river can't support baiji, someday it won't support humans either." Indeed, baiji aren't the only animal facing extinction. Wang says the finless porpoise, another large cetacean native to the river, has also seen its population plummet because of shipping and hydrological engineering. When Wang surveyed the river in the early 1990s, he found about 1,200 of the porpoises; 15 years later, there were fewer than half that number left. But Wang says it may not be too late to save the species. Galvanized in part by the baiji's disappearance, Chinese scientists are taking aggressive steps to rescue the finless porpoise, including breeding the animals in a lake preserve. In fact, Wang believes it may not even be too late for the baiji: there may be a handful of baiji dolphins left in some isolated backwater of the Yangtze. If they can be located and captured, he says, breeding might yet save their species. Pfluger, however, is not so optimistic. "Maybe one or two are left," he says. "But they don't have any chance to survive."